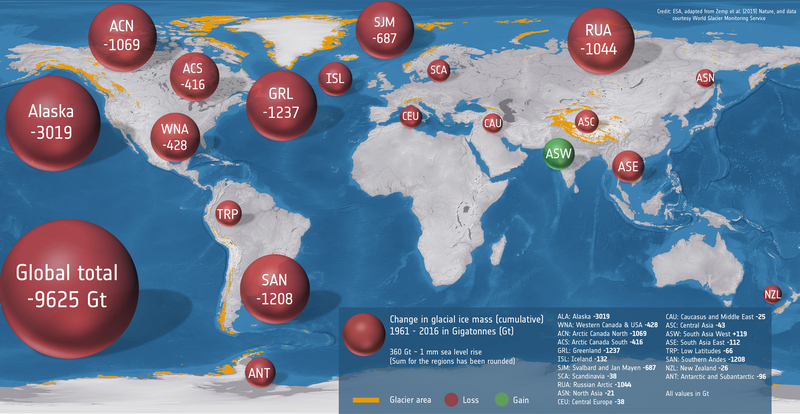 A recent report published in the journal Nature has gone over mass changes in our glaciers on a global level and it puts a lot into perspective. This report covers the rising sea levels from 1961 all the way to 2016 and if you haven’t seen it yet, it might be worth taking a peek at. For those who do not know, the glaciers of our world are currently (and have been for a while now) retreating and thinning. Basically, the ocean has managed to go up by about 27 millimeters because of this issue and things seem to be melting a lot quicker than most realize. It seems mountain glaciers alone contribute to almost a third of the sea-level rise we’ve measured and if things continue as they are sea levels will rise by three millimeters each year. Glaciers distinct from the Greenland and Antarctic ice sheets cover an area of approximately 706,000 square kilometers globally1, with an estimated total volume of 170,000 cubic kilometers, or 0.4 meters of potential sea-level-rise equivalent2. Retreating and thinning glaciers are icons of climate change3 and affect regional runoff4 as well as global sea level5,6. In past reports from the Intergovernmental Panel on Climate Change, estimates of changes in glacier mass were based on the multiplication of averaged or interpolated results from available observations of a few hundred glaciers by defined regional glacier areas7,8,9,10. For data-scarce regions, these results had to be complemented with estimates based on satellite altimetry and gravimetry11. These past approaches were challenged by the small number and heterogeneous spatiotemporal distribution of in situ measurement series and their often unknown ability to represent their respective mountain ranges, as well as by the spatial limitations of satellite altimetry (for which only point data are available) and gravimetry (with its coarse resolution). Here we use an extrapolation of glaciological and geodetic observations to show that glaciers contributed 27 ± 22 millimeters to global mean sea-level rise from 1961 to 2016. Regional specific-mass-change rates for 2006–2016 range from −0.1 meters to −1.2 meters of water equivalent per year, resulting in a global sea-level contribution of 335 ± 144 gigatonnes, or 0.92 ± 0.39 millimeters, per year. Although statistical uncertainty ranges overlap, our conclusions suggest that glacier mass loss may be larger than previously reported11. The present glacier mass loss is equivalent to the sea-level contribution of the Greenland Ice Sheet12, clearly exceeds the loss from the Antarctic Ice Sheet13, and accounts for 25 to 30 percent of the total observed sea-level rise14. Present mass-loss rates indicate that glaciers could almost disappear in some mountain ranges in this century, while heavily glacierized regions will continue to contribute to sea-level rise beyond 2100. In order to get a detailed look into the melting of these glaciers, researchers used data that they had collected from airborne and satellite surveys to measure the changes in volume based on calculations. According to National Geographic between 2006 and 2016 alone, the increase was one milliliter per year. The glaciers also have seasonal changes as to be expected but more extreme more is being lost than what is regained. The Peruvian Andes are home to some of the world’s most heavily relied upon glaciers. Since the Inca, Peru’s glaciers have been a crucial source of freshwater for human consumption and agriculture. A study published last October in the journal Scientific Reports estimated that the Quelccaya Ice Cap, a region that spans more than 9,000 football fields, could reach a tipping point if emissions aren’t reduced in the next 30 years. 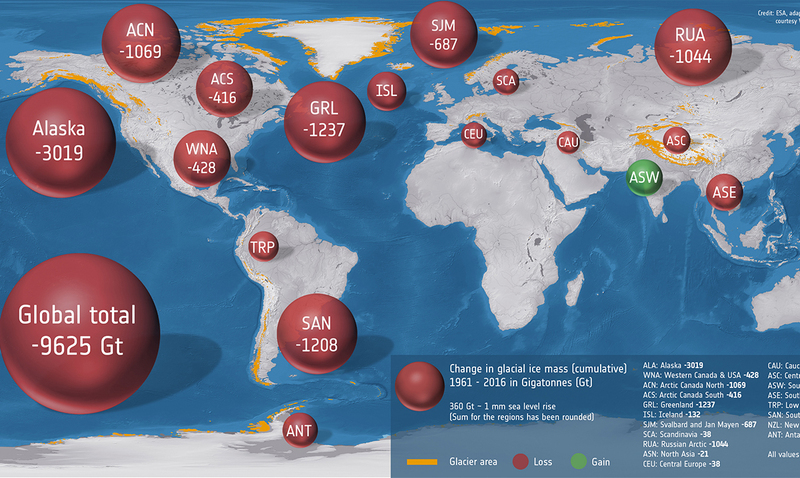 Mashable went on to break this change down as losing 335 billion metric tons of ice per year. For those who do not know this would be the same weight as 27 billion 747s. As noted above this issue is already starting to affect people to learn more please feel free to click here or check out the video below.